Ag Industry, Do we have a problem yet? I’ve been trying to wrap my head around this whole issue of perspective lately. I think a person’s perspective is an important thing to consider when it comes to the issues we are seeing with off-target movement of dicamba in this country, and especially when it comes to the reasons that are offered for off-target movement. Never has a difference in perspective been more apparent to me than what I have seen happen for the past year, and especially for the past two months, within the agricultural industry. I get calls daily from those who say we have a major problem with off-target movement of dicamba and something has to be done about it. Most of these calls are from soybean farmers who have had their crops drifted onto. Some are from homeowners or vegetable producers. Others are from representatives with other competing companies that don’t have a stake in any dicamba product or the Xtend technology. There’s that perspective thing again. More recently, most of these calls are from independent agronomists, agricultural retailers, and custom applicators who have been making applications of these approved dicamba formulations and have now decided to stop spraying these products for the rest of the season because of the off-target movement that has occurred despite their best efforts to keep these products in place. I also get calls daily (and read articles and company "position" blogs, posts, tweets, etc.) from those who say we don’t have a major problem at all, and that people like me are drawing more attention to an issue that isn't really a problem, and that this is just a normal part of the "learning curve" with any new technology. Most of these calls (or articles, blogs, posts, tweets, etc.) are from company representatives that either make one of the approved dicamba products, or sell the Xtend trait. Some of these calls are also from farmers and/or farmer seed dealers who say they have sprayed one of the approved products on their Xtend soybean and have had zero problems. More perspectives I guess. I shouldn't be surprised by all this but I must confess it is baffling to me; here we have people within the agricultural industry that are all presumably watching the same thing unfold in front of their eyes at the same time, yet these people have a completely different perspective as to how significant this issue really is. So I thought maybe I would try to expand all of our perspectives (mine included) outside of just what is happening in Missouri or anywhere else. I thought I would try to put a ‘U.S. perspective’ on this issue. The purpose of this article is NOT to debate whether the off-target dicamba problems are due to drift, sprayer error, volatility, contaminated glufosinate, calcium deficiency, temperature inversions, inadequate training by universities, generic dicamba, the coming solar eclipse, or any of the dozens of other explanations I’ve seen put forward. I’ve already spent plenty of my summer arguing about these reasons and based on current responses from industry, it looks as if I’ll be spending most of the rest of the year doing more of the same. Regardless, several of my colleagues have written brilliantly on these topics so I've decided there is no need for me to try to re-invent the wheel and tell you something that I literally could not say any better than what has already been said. If you have not read these articles already, I would highly recommend that you do so. They are well worth the read (from my perspective): The Dicamba Dilemma in Illinois: Facts and Speculations, by Aaron Hager, Associate Professor, University of Illinois; I Can’t Keep Dicamba in the Field by Larry Steckel, Extension Weed Specialist, University of Tennessee; and Thoughts on the Dicamba Dilemma by Bob Hartzler, Professor of Agronomy, Iowa State Unviersity. The purpose of this article is simply to broaden our view and provide a national perspective of the problem as it stands right now, in hopes that at least some in the industry can agree that this is a substantial problem that needs to be addressed. Oops, I kind of let my own perspective slip there a bit. In order to do this, I requested information from many state Departments of Ag about the number of official dicamba-related investigations that are currently under way in 2017. This information is shown in Figure 1. If a state isn’t colored in on this map, it simply means that either I did not get a response from that state, or that I never requested any info because they produce little to no cotton or soybean. However, as Dr. Hager pointed out in his recent article, to estimate the extent of the dicamba injury problem using the number of complaints filed with the state Departments of Ag as the sole metric would be to "grossly underestimate the current reality". Figure 1. Official dicamba-related injury investigations as reported by state departments of agriculture (as of July 19, 2017). Because I agree with Dr. Hager’s statement, I also polled a number of university extension weed scientists from around the country and asked them to provide me with their best estimate as to the number of soybean acres injured by dicamba in their respective states. These estimates are shown in Figure 2. I’m sure many will have problems with these numbers, but I can assure you that none of these individuals took these estimates lightly. These estimates weren't just generated out of thin air, they were generated by polling Extension agents around the state; by personal field visits of affected areas; through emails, calls and texts from injured parties; and through various consultations with trusted ag retailers, applicators, and farmers around each state. 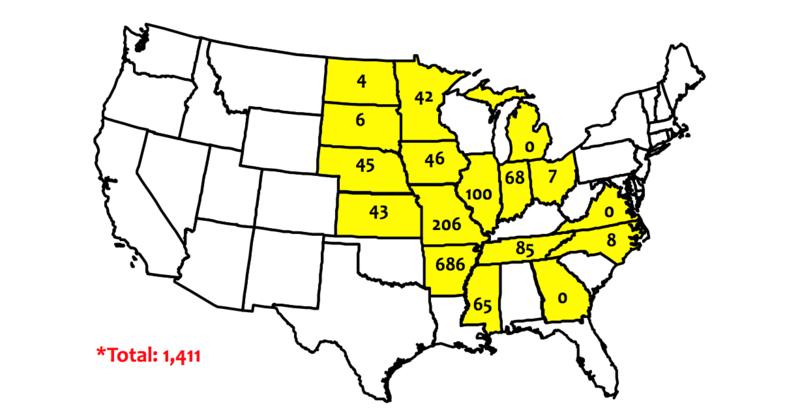 As with Figure 1, if a state isn’t colored in on the map, it is either because there was no weed science contact in that state, or because that state produces little to no soybean. Figure 2. Estimates of dicamba-injured soybean acreage as reported by state extension weed scientists (as of July 19, 2017). 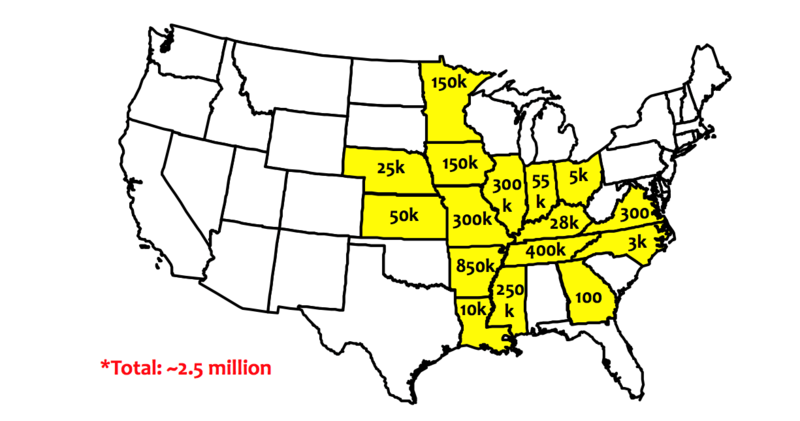 First, does 1,411 official dicamba-related injury investigations and/or approximately 2.5 million acres of dicamba-injured soybean constitute a problem for U.S. agriculture? I guess it depends on your perspective but my answer is an emphatic yes. If you think so as well, let others know how you feel and let’s stop the standard denial routine that I have heard so often this season. Instead, lets put our time and effort into figuring out where we go from here as an industry and what’s going to be different about next season. Second, I said previously that the purpose of this article is NOT to debate about the reasons for off target movement. And it isn’t. And I’m not. But the reasons for off-target movement of dicamba are the number one thing we are going to have to discuss if you agree that there is a problem. So my last question is this; can you look at the scale and the magnitude of the problem on these maps and really believe that all of this can collectively be explained by some combination of physical drift, sprayer error, failure to follow guidelines, temperature inversions, generic dicamba usage, contaminated glufosinate products, and improper sprayer clean out, but that volatility is not also a factor? I know what my perspective is, what's yours?